Bridges are important structures especially for an archipelago like the Philippines. It helps people reach their destination easily by land without spending much by traveling air or risky travel by water. In fact, bridges are also created to be a sign of boundaries of two places. 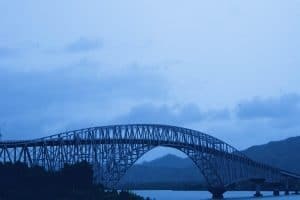 And now, when we talk about longest bridges in the Philippines, there are amazing architectures you may want to check. Below are the longest bridges in the Philippines. 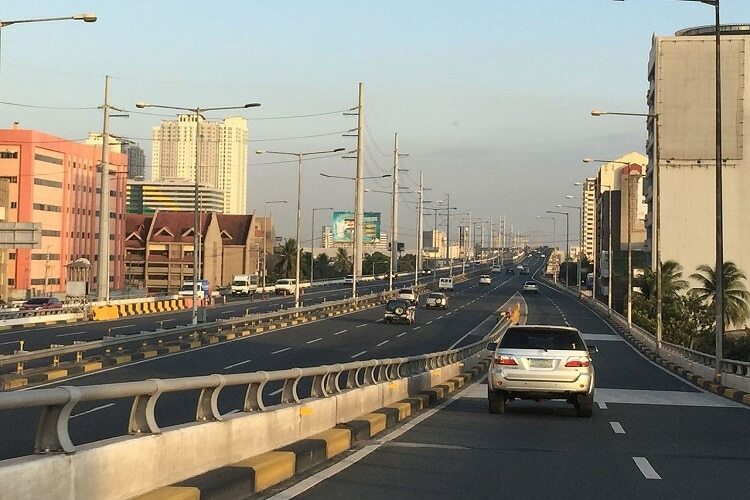 The Metro Manila Skyway is the country’s longest bridge with 10 km long and 17 km long including Bicutan-Alabang section and is the first fully grade-separated highway in the Philippines. 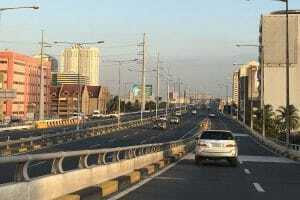 It is elevated highway in Metro Manila crossing over existing South Luzon Expressway (SLEX). 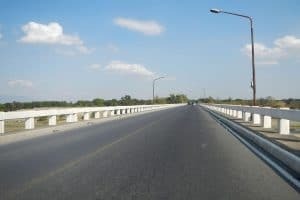 Candaba Viaduct is also known as “Pulian-Apalit Bridge.” It is a 5 kilometers bridge in the North Luzon Expressway (NLEX), consisting of four lanes. Construction Development Corporation of the Philippines (Now, Philippine National Construction Corporation) built it and was designed by Aas-Jakobsen. Also, the viaduct is raised over Candaba Swamp, which keeps the highway open to traffic even when the swamp gets flooded during the rainy or monsoon season. 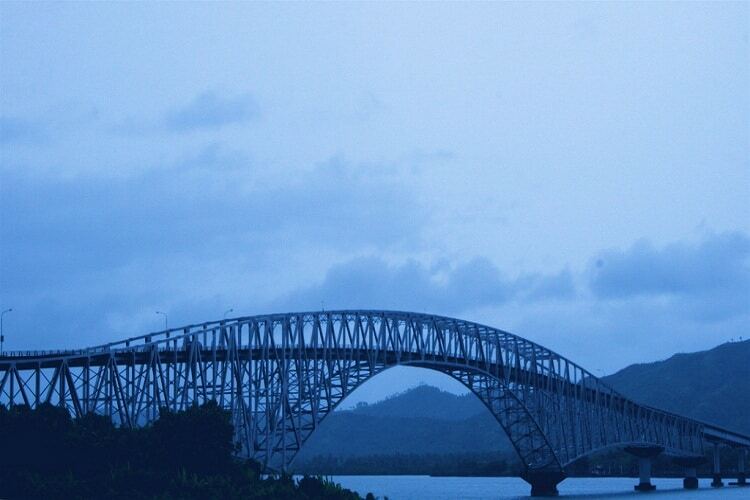 San Juanico Bridge is one of the longest bridges in the Philippines with a length of 2.16 km. It is part of the Pan-Philippine Highway and stretches from Samar to Leyte across San Juanico Strait. A steel girder viaduct is its longest length and its main span is of an arch-shaped truss design. It is accessible by passenger jeepney, motorcab, bus, or private vehicle. The construction was worth $21.9 million, which started on 1969 and completed four years later. The bridge was also dedicated to Ferdinand Marcos’ wife, Imelda Marcos. 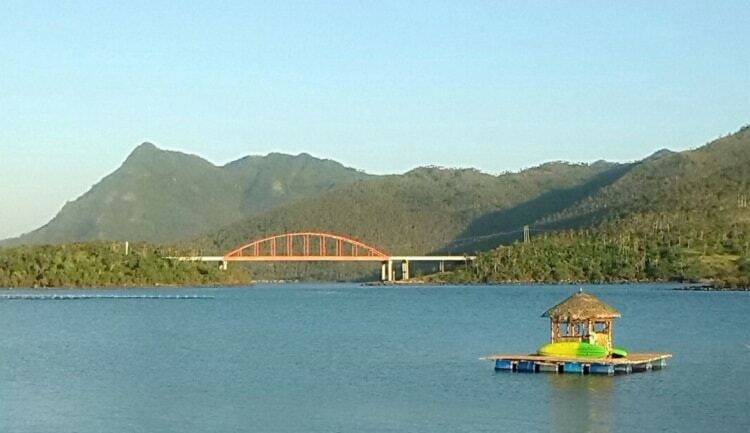 Narciso Ramos Bridge is located in the Province of Pangasinan, Ilocos. It has a length of 1.442 km that connects the towns of Asingan and Sta. Maria in the province of Pangasinan. 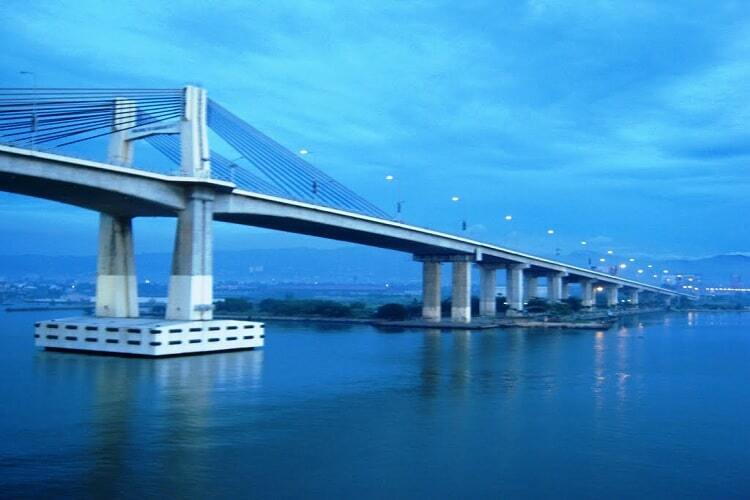 The bridge was opened in year 1997 and is one of the most important projects of former President Fidel V. Ramos. 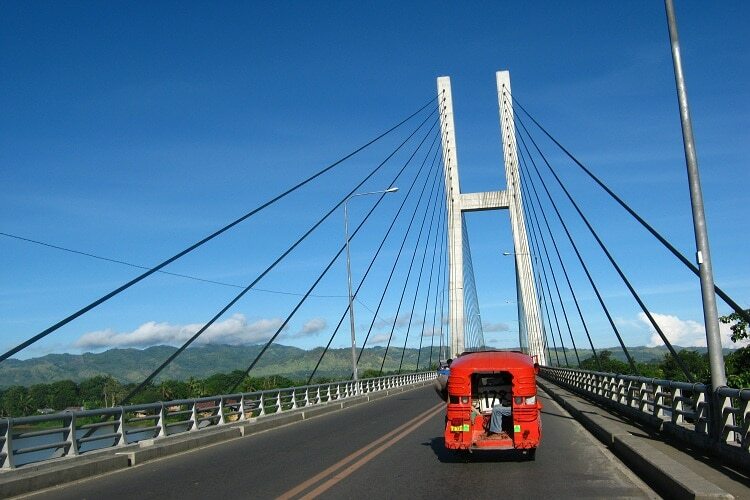 Buntun Bridge is considered as one of the longest bridge in the Philippines. It has a length of 1.369 that stretches from Tuguegarao City to Solana, Cagayan and spans over the mighty Cagayan River (the largest river basin in the country). 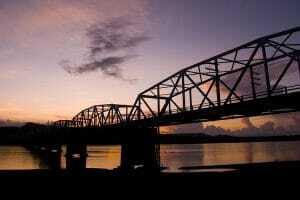 It was constructed for the sake of the travelers who want to cross Cagayan River. 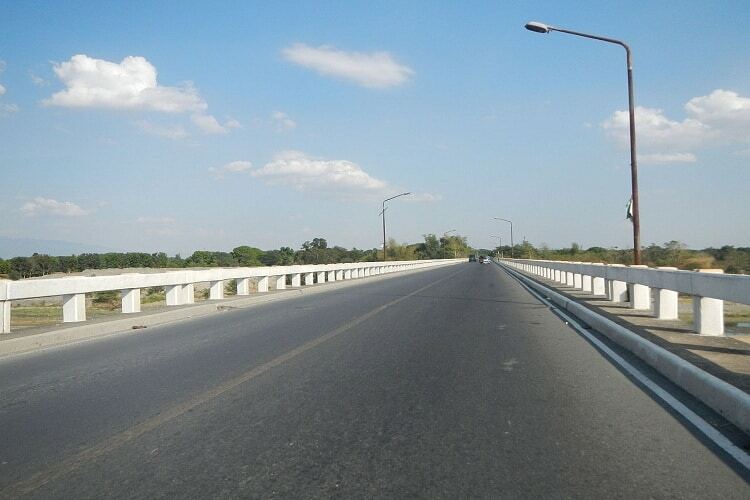 The bridge has also been known as the gateway to the City of Tuguegarao. The Buntun Bridge has a total of 15 spans, long enough to carry more than 18 tons of vehicles. The construction was worth 4.6 million-dollar and was contracted to the Construction and Development Corporation of the Philippines (now the Philippine National Construction Corporation). Patapat viaduct is located at the municipality of Pagudpud, Ilocos Norte. 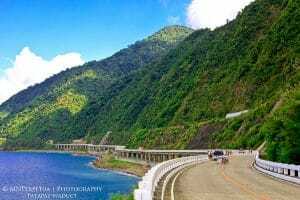 It is elevated 31 meters over sea level and has the length of 1.3 km that connects the Maharlika Highway from Ilocos Region to Cagayan Valley. It is also one of the most scenic and photographed destination in the province. The concrete coastal bridge has two lanes of traffic. It was constructed by Hanil Development Co, Ltd . and was completed in October 1986. San Juanico Bridge and Patapat Viaduct are both projects done under the Marcos administration that’s why the roads has similarities. 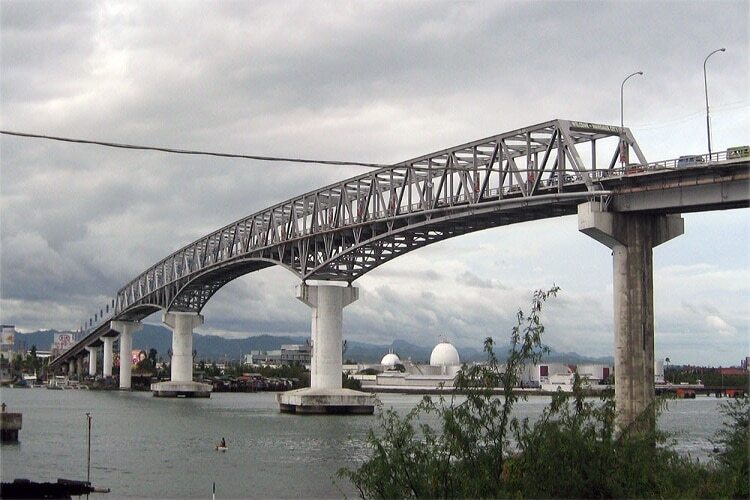 Marcelo Fernan Bridge is an extra-dosed cable-stayed bridge located at Metro Cebu, which has the length of 1.237 km. 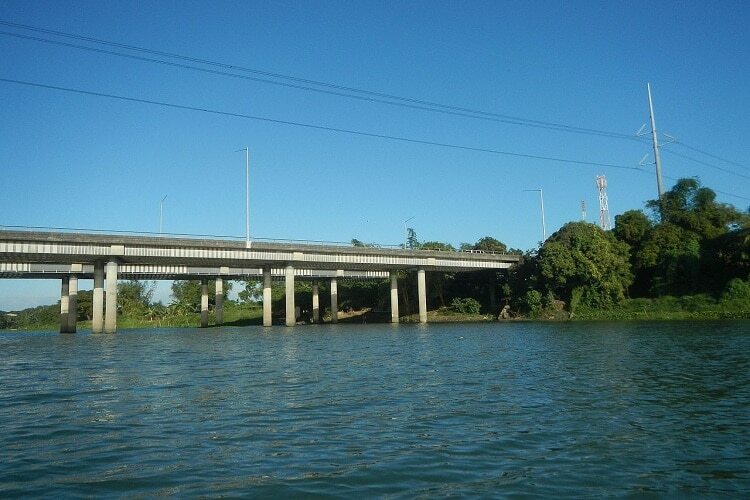 It is the second bridge that connects the mainland Cebu to Mactan and has four lanes. It was also constructed with the help of the Japanese Government and was opened in August 1999. Magat Bridge is a road bridge located at Cabatuan, Isabela with a length of 0.926 km and was completed in 1991 under the administration of Corazon Aquino. 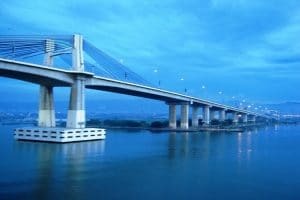 Macapagal Bridge is the longest bridge in Mindanao; it is located in the outskirts of Butuan City in the province of Agusan Del Norte. 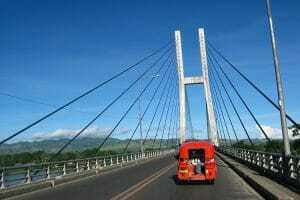 It has a length of 0.9076 km that connects the Butuan-Cagayan-Iligan Road and the Philippine-Japan Friendship Bridge. It was completed in May 2007 and was a project funded by Japan bank for International Cooperation for the people in Butuan. 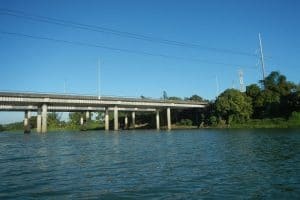 The bridge was lobbied to former President Fidel V. Ramos, then was approved by former President Joseph Estrada, and finally implemented under the administration of former President Gloria Macapagal Arroyo. Mactan Bridge is officially the Serging Osmeña Bridge that connects Mandaue City with lapu-lapu City in Metro Cebu. It has a length of 0.864 km and is one of the two bridges that spans across the Mactan Channel. 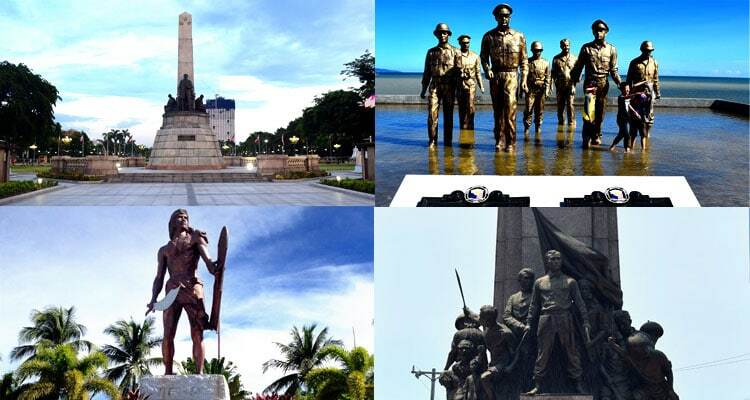 It was constructed during the term of late President Ferdinand Marcos, which began in 1970. It was then inaugurated in 1972 at 65 million pesos. People have been using bridges to facilitate mobility since the ancient time. Bridges cross valleys and waters to shorten distances and also reduce travel time. With its the amazing construction that people have accomplished over time, it is interesting to see how these lists changes as bridges become longer. Biliran is a small island province in Eastern Visayas which got its name from a native grass which grows abundantly in the island called Borobiliran. During Spanish occupation, the island used to be a part of Cebu Province and was called Isla de Panamao then it became a part of Leyte Province in 1768 and in 1992 it became an independent island province. 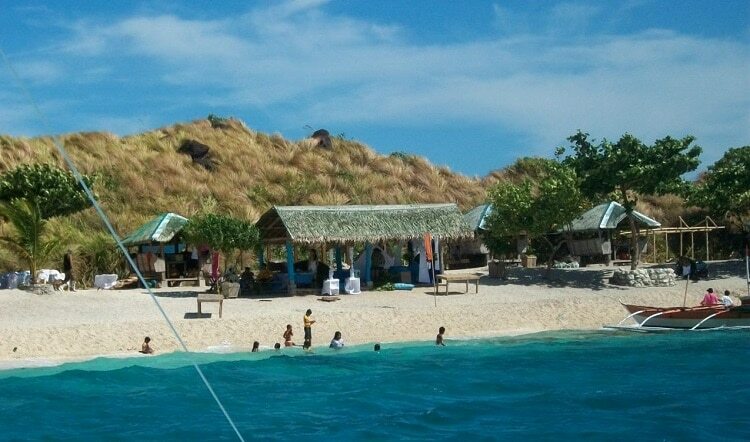 The island is about two and a half hour drive from Tacloban City. 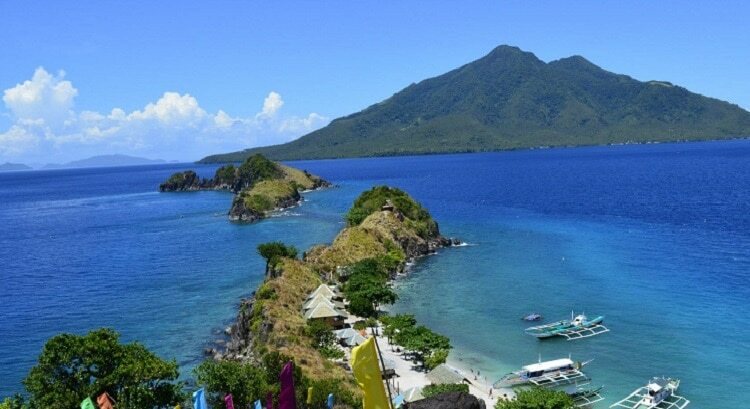 Biliran may be a small being the 4th smallest province in the Philippines with a total land area of 53,601 hectares but it is blessed with beauty and offers the finest beaches one could expect in a tropical island. If you are looking for a place to go for swimming, relaxation and sight-seeing, Biliran Province offers that and more. What can you expect from an island province? White sand beaches, waterfalls, hot spring, and of course, friendly locals who would always greet you with a warm welcoming smile. The province of Biliran is composed of the main island and other smaller islands such as Puro Island which connects the province to Leyte, the island municipality of Maripipi, Higatangan Island which is well-known for its shifting sandbar, Sambawan Island and Dalutan Island known for its white sand beach and pristine clear water. If you are planning to go island-hopping, you might want to take a longer vacation leave because I am sure you would want to spend a whole day in each island I have just mentioned. When visiting Biliran, make sure you have your sunblock lotion ready because it’s gonna be a long day under the sun. Since the island is surrounded by beautiful beaches, swimming is an absolute must do. The clear blue water which reflects the color of the sky looks so inviting! I’m sure no one would be able to resist plunging in. 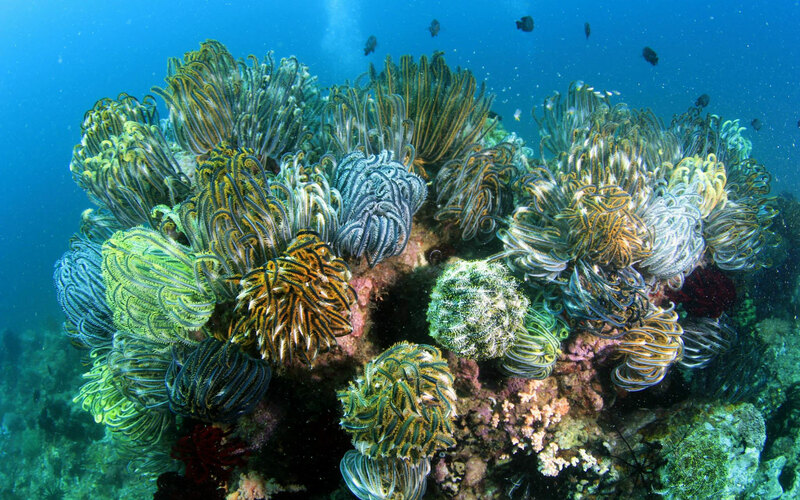 Biliran Island is not only beautiful in the outside, but there is also a beautiful underwater world waiting to be explored. I’m talking about the beautiful coral reefs and colorful fishes you can see when going for a scuba-diving. For as low as 1,800 Php. you can go for a Fun Dive with scuba gear at Agta Beach Resort in the Municipality of Almeria. Soothe your sore muscles at Mainit Hotspring. Image by Rowena Gabuya via Facebook. Did you know that Biliran is a volcano island? But there is no need for you to be alarmed because according to Phivolcs, there is only one historic activity which happened on September 26, 1939. 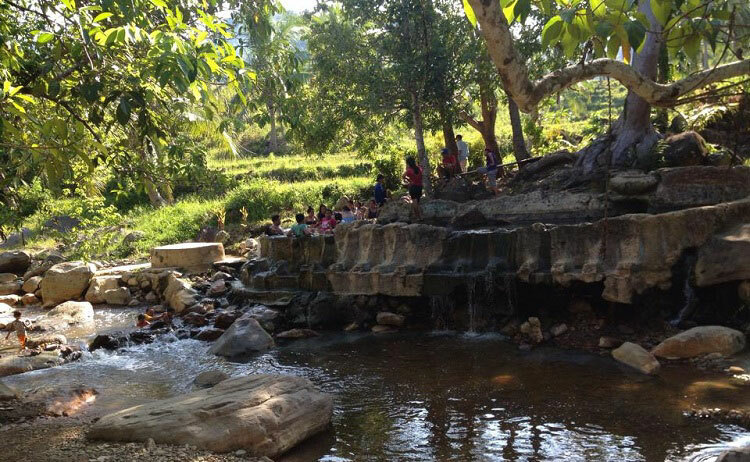 But because of that volcano, you can enjoy a warm bath at the Mainit Hot Springs in Caibiran, Biliran. You can dip yourself in a warm and soothing water to relax sore muscles. Biliran, just like other islands in the Philippines have a very colorful history which dates back to pre-Spanish era. 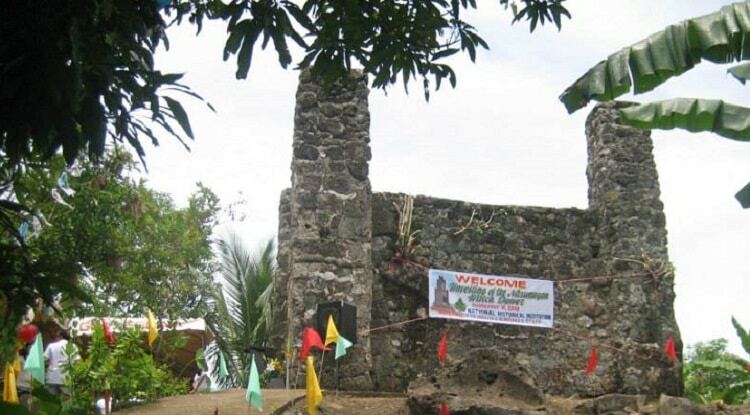 During the times when Moro raids were rampant the people of Biliran built a watchtower near the church but in one of those raids the Moros burned the settlement and only this watchtower made of stone and coral blocks remained standing. Hence, the place is now called Nasunugan located in Brgy San Roque, Biliran. It was reconstructed in 2000 and was recognized by the National Historical Institute of the Philippines as one of the country’s historical landmarks in 2008. Aside from swimming, beach resorts in Biliran also offer other amenities. 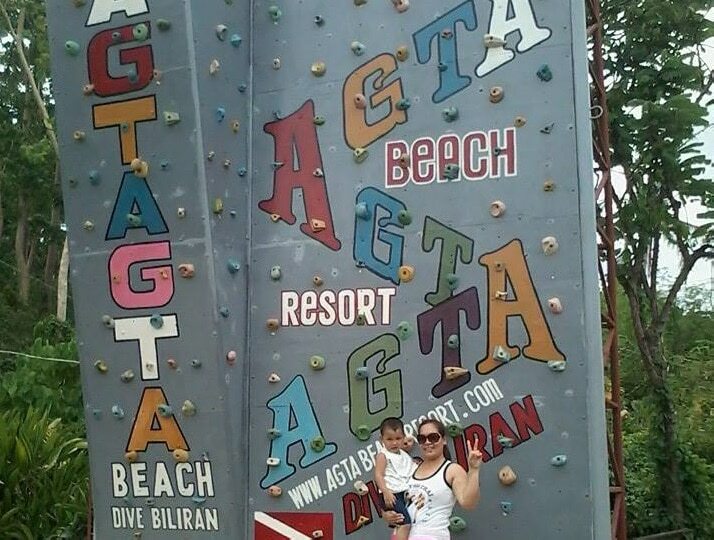 If you are into wall climbing, why not try this climbing wall in Agta Beach Resort? You would not miss it for sure because it is just right at the entrance of the resort. It is a fun way to start a day with friends before plunging into the sea. 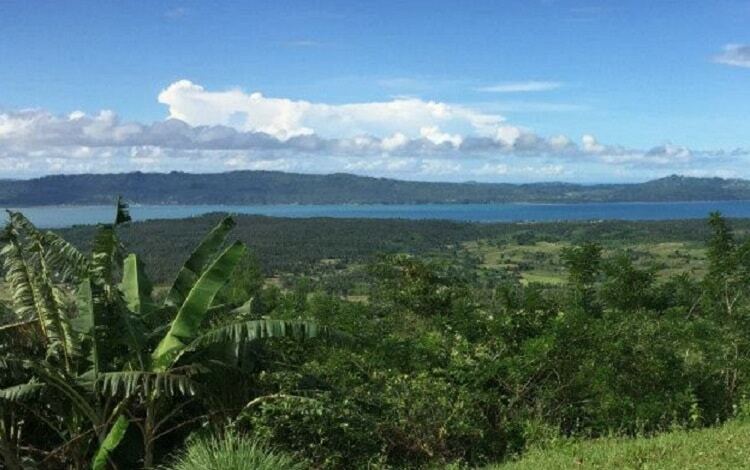 You can see the town of Biliran and some parts of Leyte from Binongtoan. Hiking up to Binongtoan is like a pilgrimage for Biliranons. It is the place where Padre Gaspar Ignacio de Guevarra brought the town folks during the so-called Biliran Religious Revolt from 1765 to 1774. From Biliran town proper, you can ride a motorcycle up to Brgy Hugpa or Brgy Canila and from there you can start hiking. Before reaching the peak, people would stop by at a spring water to drink sweet, cold and refreshing water which some people believes to be miraculous. When you reach the peak make sure you have your camera ready for the picturesque view in front of you. Usually, people go there during Saturdays to light a candle at a huge white rock. People of Biliran built a small chapel there where a priest would celebrate mass during the celebration of a Fiesta in honor of Padre Gaspar every February 19-20. 8. 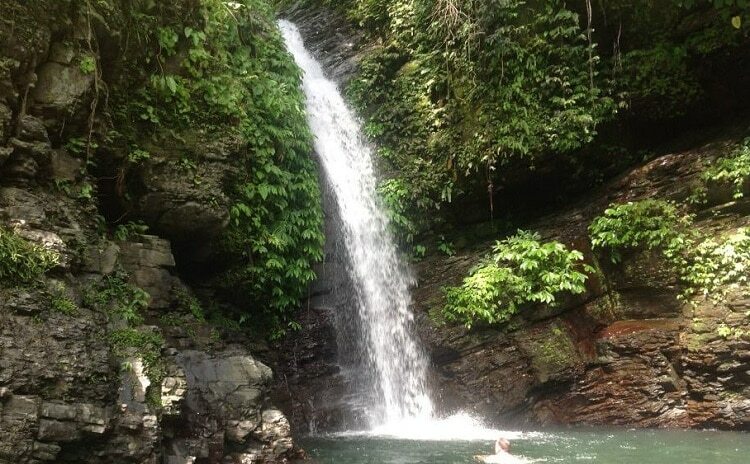 Fall in love with stunning falls in the island! No one could resist the tempting nature’s beauty which Biliran possess. One of the province’s tourist attractions are the numerous falls which can be found in almost every town. There are also other falls to choose from like Kasabangan Falls in Cabucgayan, Kinaraha Cascades in Caibiran, Pundol Falls in Almeria, Busai Falls in Kawayan, Tigbaw Falls in Brgy Julita, Biliran , Ulan ulan Falls in Almeria, Tinago Falls in Caibiran and many others. Bagasumbol Festival in Naval during town fiesta every 1st Saturday of October. Municipalities of Biliran Province preserve the historical significance of local festivals, which showcases their cultures and histories. 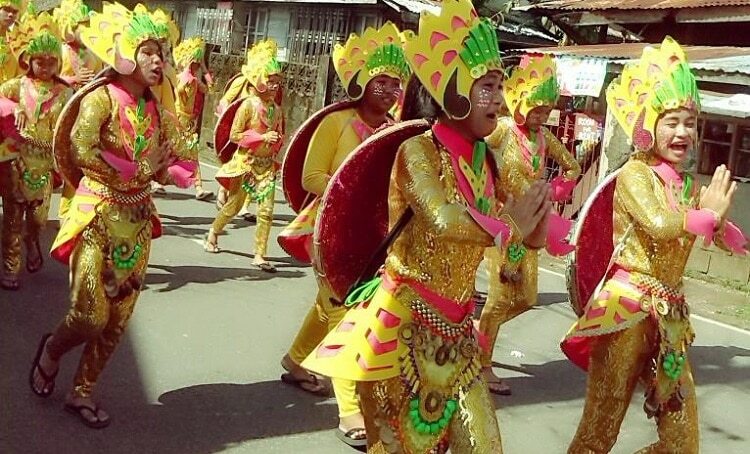 Hudyaka or merriment is one of the best parts of the celebration of Biliran Provincehood held every May 11. Just like Pintados, it showcases various festivals of the municipalities in the province. Other festivals are; Bagasumbol Festival in Naval during town fiesta every 1st Saturday of October, Ibid Festival in Caibiran during town fiesta every 25th of July, Ginalutan Festival in Maripipi during town fiesta every 29th of September, Bucgay Festival in Cabucgayan every 2nd week of October, Gapnod in Almeria during charter anniversary every 1st of September, Subingsubing Festival of Kawayan every 24th of October and Borobiliran Festival in the town of Biliran during the celebration of its Pueblo Day every 9th of September. 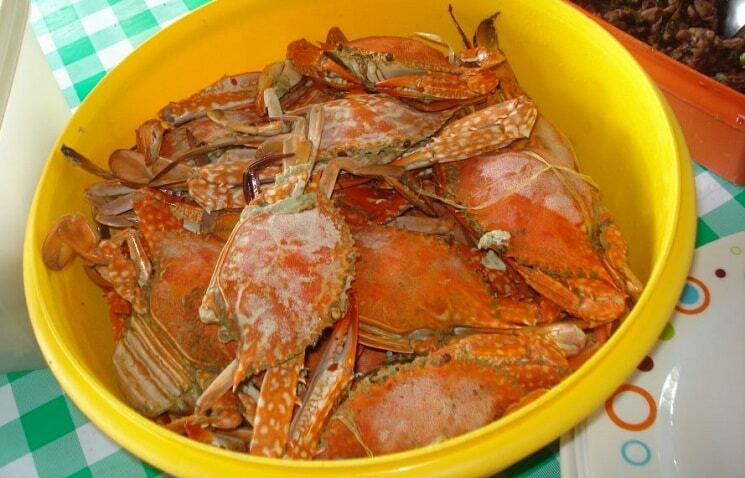 Fresh crabs from Biliran is always present in any occasion. Since Biliran is surrounded by seas, fresh seafood is abundant. You can fill your stomach with freshly caught fish, shrimps and crabs at a low cost. Aside from the sumptuous seafood there are also restaurants in the island which serve Italian and American cuisine. Plus you can also try some of the sweet delicacies such as sampilot and mamban. Or find out why Balintawak is the famous pasalobong from Biliran, it is a suman or rice cake which is a combination of black and white sticky rice wrapped in coconut leaf. When in Biliran, you can EAT seafood to your heart’s content, fall in LOVE with the scenery and PRAY that you could visit the island again. Biliran may not be a well-developed tourist destination but seeing its natural beauty is truly exhilarating. If you are looking for a place to relax and forget the stress a city life gives you, Biliran is the place to be.